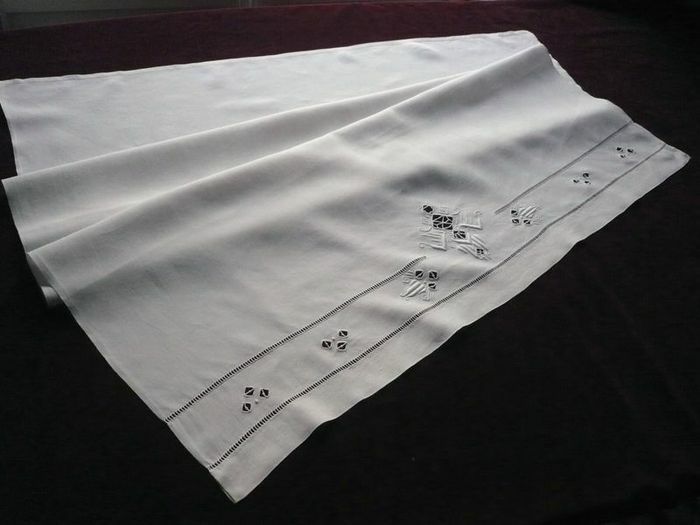 A stunning little infant sheet loomed of the finest silken eggshell white "fil de lin" linen. This darling sheet has stylized art deco style embroidery in bourdon, tige point, and Richelieu cutwork all along its return border as well as two rows of drawn thread work. Hand hemmed. Impeccable condition. As this lightweight but tightly woven linen is cozy but also breathes, it's ideal for spring and summer weather! Dimensions: 47 x 31.5in.